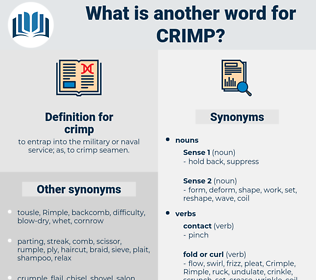 What is another word for crimp? 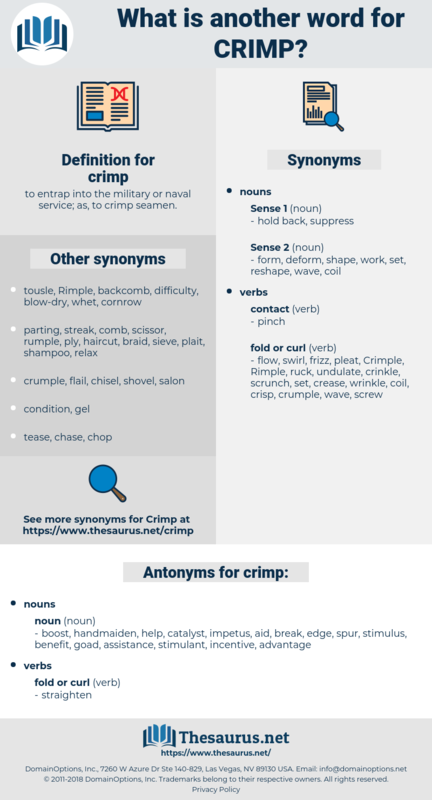 to entrap into the military or naval service; as, to crimp seamen. threw a monkey wrench in to. boost, handmaiden, help, catalyst, impetus, aid, break, edge, spur, stimulus, benefit, goad, assistance, stimulant, incentive, advantage. He's got Stangeist and his gang steered for the electric chair now; he put a crimp in the Weasel the other night - get that?
" Well, we'll put a crimp in him, all right," he said, with a laugh. corymb, corn poppy, cream off, crambe, crump, carnify, crime wave, corn beef, cream puff, cramp, churn up, carnauba, crumb. spit curl, kiss curl, pin curl. turn up, fold, fold up.